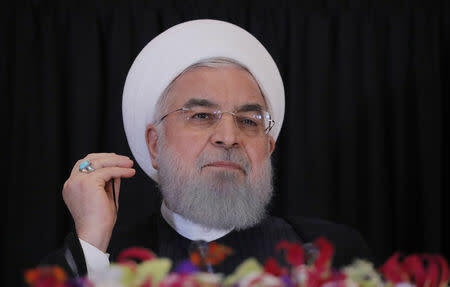 DUBAI (Reuters) - Iranian President Hassan Rouhani on Saturday accused the United States of seeking "world hegemony" and denounced Washington for trying to topple Tehran's ally, Venezuelan President Nicolas Maduro, state media reported. "The Americans are basically against all popular revolutions and independent countries and seek world hegemony by suppressing them," Rouhani said in a meeting with Venezuela's new envoy in Tehran, the state news agency IRNA reported. The U.S. government has recognised opposition leader JuanGuaido as Venezuela's interim president. Most Latin Americancountries have done so as well, while European governments arealso throwing their support behind Guaido, albeit morecautiously.